Protecting brand reputation is a key challenge for marketers. It is of the upmost importance to ensure your content is placed on the right channels, to the right audience. There’s almost nothing worse for a brand’s reputation than for them to be associated with the opposite of what they stand for, especially if that site is encouraging terror or dangerous practices. We believe that in order to be fully in control of any placement, it is important to use sophisticated digital ad targeting to ensure your marketing message is communicated to the right audience online. It has become standard practice to apply programmatic advertising but one of the challenges with this approach is that there is a real lack of control where ad placements end up. 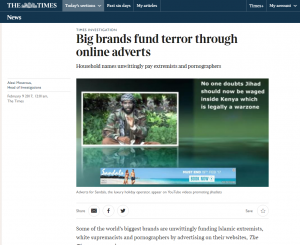 Today the Times reported that digital ads for several leading brands have been displayed on the wrong websites, ranging from organisations that are suspected of supporting terrorism to pornographic websites. By applying sophisticated ad targeting technology and being specific about the appropriate channels, marketers can ensure that their ads are displayed to the right people at a time when they are perceptive to the marketing messages. As a social media ad targeting technology start-up we are committed to guarding our client’s brands and ensuring that we can guarantee that their marketing messages are displayed to the right people, in the right place at the right time.